Compare prices on car hire in Aberdeen from all the major brands and find the best deals. When you book through us, unlimited mileage and insurance are always included in the price given. Aberdeen is located in the northeastern part of Scotland and is located on the east coast bordering the North Sea.Aberdeen is located close to the place where the River Dee flows into the North Sea, and the city has a large fishing port and is an important trading center. 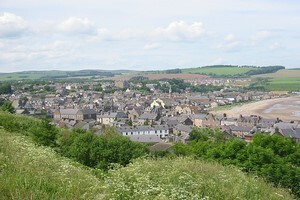 In 2008, the population of over 180,000, making Aberdeen to the country’s third largest city. Aberdeen received city status in 1179 and consists of the Old Aberdeen and New Aberdeen. Aberdeen has been given nicknames like “granite city” and “Silver City” because many of the buildings are built of granite that can flash like silver in certain types of light. Like many other places in Scotland is also in Aberdeen several historical castles, including Glenbuchat Castle and Ballindalloch Castle from the 1500s. Scotland is also known for whiskey and there are opportunities for tours and tastings at several distilleries such as Glenfiddich Distillery and Cardhu Distillery. Aberdeen Airport is the second busiest international airport in Scotland and is located nearly 10 km outside the city.